Should you have your garage sale in the spring, summer, winter, or fall? Which month is best for yard sales? What’s the best time to have a garage sale? The answers to these questions largely depend on where you live. In warm weather climates, garage sales are popular year-round. But this isn’t the case in states that experience colder temperatures during the winter months. In general, springtime yard sales are probably the most popular, especially early spring when shoppers have cabin fever and are itching to hit the streets in search of yard sale bargains! After early spring garage sales, summertime yard sales are always a hit. The second Saturday of August is National Garage Sale Day every year — if that tells you anything. End-of-the-summer garage sales do well too, but my new favorite time of year for a garage sale is in the fall. Why? Because my most successful yard sale ever took place in October (in Tennessee). One thing’s for sure… regardless of when you actually have your yard sale, you need to start preparing early! I’ve had yard sales on Friday, Saturdays, and Sundays before. And in all parts of the country, too, including New York, Florida, Texas, Indiana, and Tennessee. Fridays are so-so. They work best if your home is located on a well-traveled street in town. You’re likely to get some work traffic this way — both at lunchtime and after work. You’ll see mostly dealers and retirees on Fridays. Depending on the type of items your selling, this could work to your advantage. Saturdays are without a doubt, the best. I generally have my yard sales on Saturdays only. Sundays are rarely as profitable as Saturdays. However, Sundays do attract the diehard yardsalers — the ones who are on a mission and typically looking for very specific items. (They’re usually the ones who “do this every Sunday.”) Also, think about the sheer number of people who attend church Sunday mornings (and often go out to eat after that) — which means they’re not as likely to visit your yard sale. Unless you promote some very specific & hard-to-find items in your yard sale ad, chances are a Friday or Sunday yard sale will hardly be worth the time you spend sitting there waiting for people to arrive. 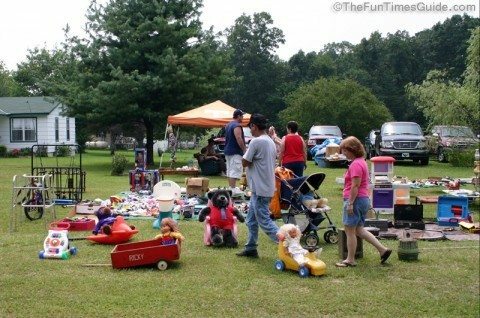 A few people will make a trip back to your yard sale on a Sunday to try to buy something that they thought was overpriced when they were there earlier. However, most people will skip a Sunday sale — if they see your sale started on Friday or Saturday — for fear that the best items will all be gone. And if they do go to the effort to stop at your Sunday sale, they’ll want rock-bottom dirt cheap prices on the items. Sundays are a tad more successful at the very start of the yard sale season (March/April, depending on where you live) because people who like to go to yard sales are so eager to get out there and shop again! If there are a lot of homes for sale in your neighborhood, then a Sunday yard sale might do well, because Sundays are typically “open house” days. I’ve heard that people in Arizona and California have a good deal of success holding garage sales on Fridays. They seem to have better luck with multi-day sales too. I’ve never had much success with either of those, but then again, I’ve never had a yard sale out west! For the record, yard sales held at the beginning of the month do a little better than those held at the end of the month. The hours between 7AM and 11AM are the busiest, and the best judge of how successful your garage sale will be, overall. Many people start the yard sale at 8AM, only to find a swarm of cars waiting eagerly for you to open around 7:15 AM! IMPORTANT: I cannot stress this enough… Unless you prepare for this ahead of time, you will always be a step behind. And, as a result, you’ll probably have a bunch of hastily prepared displays and a disorganized yard sale space overall. Most likely, you will end up spending half your morning working around people, while trying organize your space. Talk about frustrating! Just know this: As long as people are aware of the fact that you’re having a yard sale (via classified ad or yard sale sign), then you will undoubtedly get people who are eager to be the first to see your bargains. There’s no way around it. This is especially true when you’ve posted a classified ad that highlights some unique or hard-to-find items. I usually wrap up the yard sale around 3PM. But without a doubt, I could easily close shop around 1PM and do just as well. If you’ve got nothing better to do that day, then use those hours to have drastic markdowns. That way, you’re not left with so much stuff — and the money will keep rolling in. After all, it’s better to get something for the items that you’re just going to take straight to Goodwill, right?! 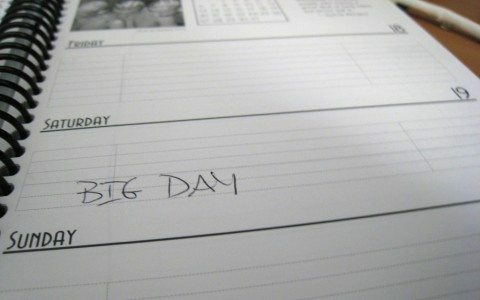 If you’re a really busy person, and you want to maximize the use of your time on a Saturday and/or a Sunday, I’d recommend shutting down at 1PM and being at peace with your results — because the rest of the afternoon is generally a major let-down, unless you work really hard to cut prices, draw people in, and make what little you do have left look super attractive to the people driving by. In the fall, Saturday October 18th was my best yard sale ever. It was in Spring Hill, TN. In the spring, Saturday April 21st was my second-best yard sale ever. It was in Franklin, TN. Both of my yard sale dates were chosen because they coordinated with my (two different) neighborhood’s official yard sale events. People who visited my yard sale kept saying how “exhausted” they were from having been to so many neighborhood sales already! Must read: Should you have a multi-family yard sale or a private garage sale? On the one hand, people may feel “shopped-out” (or broke!) by the time they arrive at your sale. On the other hand, if more people start at yours and go to the other sales afterward, then you’ll probably make out better — as long as you have a pretty good selection of high-quality stuff. Too many sales within close proximity of one another all on the same day could have the effect of saturating the area with yardsalers — making your little ‘ol sale less meaningful to those in the area, since there are so many more to choose from. It could be said that having less competition would make your sale stand out more. I mostly do it to take advantage of all the free advertising that the neighborhood HOA and other nearby yardsalers are doing (for me).